Cambridge University Press, 2002, 366 pp. This ground-breaking study traces the impact of the American Revolution and the international war it precipitated on the political outlook of each section of Irish society. It also reassesses the influence of the American revolutionary war on such developments as Catholic relief, the removal of restrictions on Irish trade, and Britain's recognition of Irish legislative independence. Morley sheds new light on the nature of Anglo-Irish patriotism and Catholic political consciousness, and reveals the extent to which the polarities of the 1790s had already emerged by the end of the American war. This book can be ordered directly from the publishers and is available in both hardback and paperback editions. "Drawing on a wide range of sources, especially newspapers, pamphlets, vernacular song, and published sermons, Dr Morley charts the evolution of attitudes in Ireland at each stage of the revolution, whether those produced directly through the operation of American example on Irish opinion or indirectly as a result of altered circumstances arising from the war." "Morley has made a very significant contribution to the literature on Ireland in the 'Age of Revolution'. This book offers us a fresh perspective on the critical decades that preceeded the turbulent 1790s and argues persuasively that we both re-evaluate the concept of the 'Hidden Ireland' (hardly a new departure), and that we come to recognise especially the complex nature of both the Catholic and Anglican populations in the final decades of the century and the fact that there was nothing inherently 'republican' about Irish Presbyterianism, a more novel idea." "Tracing in turn the evolving response of the Catholic masses and the Catholic elite, Protestant patriots and loyalists and Presbyterians over the four phases into which he has divided the American Revolution, he offers the most thorough and nuanced analysis of their positions attempted to date." "The main thrust of this excellent book rightly concerns Ireland itself. Its analysis is rich, highly perceptive, and illuminating as well as balanced in its judgments. Vincent Morley trawls far beyond the newspaper and pamphlet literature that one would expect for a study such as this and in particular includes Gaelic poetry in order to elucidate aspects of native Irish opinion. His method is a model of meticulous historical analysis ... although he includes relatively little on the formal aspect of domestic politics, he nevertheless weaves a whole-cloth picture of the impact of the Revolution in Ireland." "... Vincent Morley's book should be warmly welcomed by all students of late eighteenth-century Ireland. The book is certainly ambitious. Traditionally, political studies of eighteenth-century Ireland have focused on the views and actions of the Protestant ruling elite. In contrast, Morley consciously attempts to widen his perspective by examining the reaction of less exalted figures, in particular the Catholic poor who made up the vast majority of the population." "Legio zijn de oudere studies die de Ierse 'publieke opinie' geheel en al uit deze anglicaanse elite extrapoleerden. Dat daarbij nu ook de presbyteriaanse en katholieke zuilen worden betrokken, is wat het boek interessanter maakt ... Bovendien verdient Morley alle lof (en zal zijn boek jarenlang een standaardwerk voor de periode blijken), omdat hij nauwgezet politierapporten, dag- en weekbladen en andere efemere bronnen heeft gedepouilleerd en aan de hand daarvan talrijke voorvallen van onrust, verzet en spanning aan het licht brengt en in een veelbetekenend daglicht plaatst." Joep Leerssen, Tijdschrift voor Geschiedenis, 116 (2003). "Bhí díomá orm nuair a chualas go raibh Vincent Morley ag roghnú an dara leath den 18ú hAois mar réimse staire tar éis na hoibre den scoth a bhí déanta aige ar bheatha Aoidh Bhuí Mhic Cruitín. Cheapas go raibh na scileanna a bhí aige sa dá dhisciplín curtha amú aige. Bhí dul amú ormsa - dul amú mór. Ní hamháin go n-éiríonn leis an t-ábhar Gaeilge a úsáid go héifeachtach ach léiríonn sé tábhacht chomparáideach na fianaise go léir ó cháipéisíocht oifigiúil go dtí tuairiscí nuachtáin, litreacha, paimfléid, bailéid nó amhráin i mBéarla agus i nGaeilge." "The devices by which the obscure and disenfranchised exerted themselves to influence public events in eighteenth-century Ireland have seldom been treated with the seriousness that they merit. Morley's account has undoubtedly remedied the neglect. It pushes back into the 1770s the lineage of some of the ideas, alliances and actions of the turbulent 1790s ... the abundance of fresh detail that he has provided will take some time to assimilate into more general accounts of the politicisation of Catholic Ireland." "This is a book that is essential to its topic and admirable in its judicious handling of a fascinating subject. It is a model of the new transatlantic history." "It is now possible to write a coherent history of eighteenth-century Irish politics that genuinely accords each community an appropriate place. 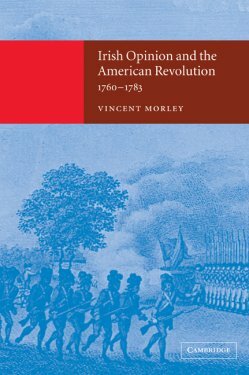 In Irish Opinion and the American Revolution, 1760-1783, Vincent Morley does exactly that. Repeatedly in his chronological treatment of his topic he subjects each of the three ethno-religious communities to searching analyses ... Notwithstanding a few quibbles, however, I find Morley's research impressive and his analysis compelling. He has significantly enhanced our ability to understand events of the late eighteenth century in their own context rather than in that of later periods." "Morley's scholarship is a major contribution to our understanding of both the Irish Catholic majority in the age of the American Revolution and to the international predicament of the British state during this period. What emerges is a refreshingly bleak picture of late eighteenth-century Ireland in which the Protestant minority and the Dublin administration were right to be paranoid; they knew that the Jacobites had not gone away." "Morley's work represents a major contribution to the historiography of eighteenth-century Ireland. His polemics, his nuanced account of the impact of the American Revolution, and his scholarship on underused and Irish-language sources demand serious consideration."